Africa RISING scientists in Tanzania have published an article in the Journal of Stored Products Research. An assessment of post-harvest handling practices and food losses in a maize-based farming system in semi-arid areas of Central and Northern Tanzania was carried out in 2012. Seventeen crops were mostly cultivated by the farmers in the surveyed areas; maize (32%), sunflower (16%) and pigeon peas (12%) were the most cultivated while maize was the most stored. There are at least 7 months between two harvest seasons of each crop; while farmers sold the crops soon after harvest to cater for household expenditure (54%) and school fees (38%), the market prices increased significantly (P 0.05) within six months of storage. Most processing activities (winnowing, dehulling, drying, sorting and shelling) were carried out manually, almost entirely by women, but mechanized processing for maize, sunflower, millet, and sorghum were commonly practiced. Quantitative post-harvest losses of economic importance occur in the field (15%); during processing (13e20%), and during storage (15e25%). The main storage pests responsible for the losses are larger grain borers (Prostephanus truncatus), grain weevils (Sitophilus granarius) and, the lesser grain borer (Rhyzopertha dominica). Most of the farmers considered changes in weather (40%), field damage (33%), and storage pests (16%) as the three most important factors causing poor crop yields and aggravating food losses. However, survey results suggest that the farmers’ poor knowledge and skills on post-harvest management are largely responsible for the food losses. 77% of the surveyed farmers reported inadequate household foods and 41% received food aid during the previous year. Increasing farmers’ technical know-how on adaptation of the farming systems to climate variability, and training on post-harvest management could reduce food losses, and improve poverty and household food security. 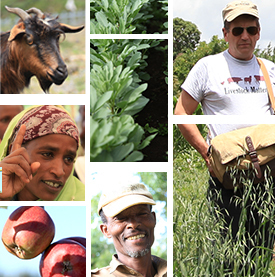 Previous post ← Measuring the ‘sustainable’ in sustainable intensification – indicators needed!